The creation of each Belleek Basket tells us a story about the amazing art of Belleek basket making. Basket and flower making was introduced to Belleek by William Henshall who came to work for Belleek Pottery in the late 1860s. Over the next forty years he developed the craft and trained the local craftsmen in the necessary skills. These in turn passed their skills down through the following generations to the present day. This explicate basket would make the perfect gift for that someone special. Due to the complexity of these baskets, each one is unique, making the one you buy like no other. The perfect wedding gift for my nephew and his new bride! It was unique and will look lovely in their new home! 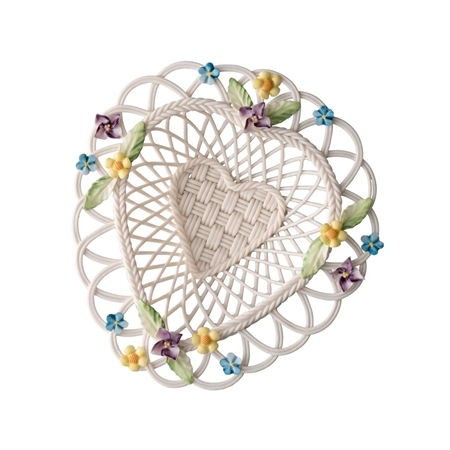 This is a beautiful, delicate basket. I am pleased to be giving it to my Goddaughter as a wedding present.